THE CAPITAL of modern IRAN, Tehran is one of the largest cities of the world with a metropolitan population of 15 million people. Located on the northernmost limit of the central Iranian plateau, the city is appropriately 3,750 ft (1,143 m) above sea level. To the northeast are the Iranian uplands and the snowcapped Mt. Demovend, legendary home to Zoroaster. The city’s climate is fairly temperate with average summertime temperatures in the upper 70s degrees F (upper 20s degrees C), but close to 32 degrees F (0 degrees C) in the winter. Its rainy season lasts between November and May. Unlike other Iranian cities, Tehran is not of ancient origin; it is too far removed from the centers of Iranian civilization to the south and west. Its earliest history dates to the 9th century C.E., when Tehran was a small village marked by subterranean dwellings. It remained such a town sitting astride the caravan route that ran across the plateau between Central Asia and Mesopotamia until 1220 C.E., when invading Mongols sacked and completely destroyed the larger nearby city of Ray. In 1553, the ruling Safavid kingdom made Tehran a second capital, using it as a resort until the decline of the dynasty. Subsequently, the city was sacked by an Afghan incursion that left the city almost deserted. Tehran recovered but remained of secondary importance until Agha Muhammad Khan, the founder of the Qajar dynasty, occupied the city, and because it was close to his tribal lands, he made it his capital in 1788. The Qajar kings enriched the city with palaces, markets, and residences, and Tehran flourished. By the end of the 19th century, city-planning, improvement projects, which included the Sepahsalar mosque, and the first telegraph transformed Tehran into a modern metropolis. 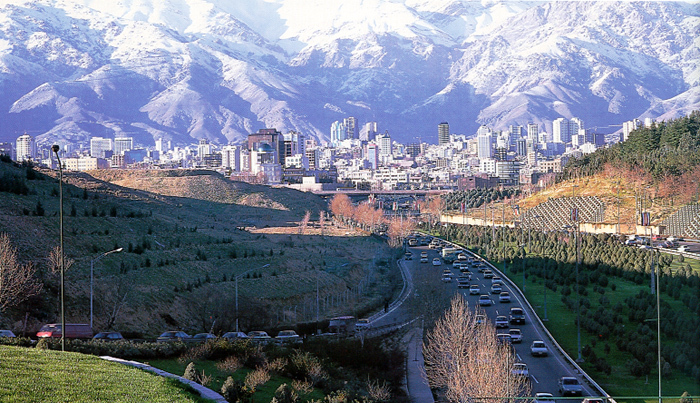 Modern Tehran, which dates to this period, is divided into three large areas. The royal residences and wealthy areas of the city are located in the north. The central part of the city is where the more important government buildings, mosques, and palaces are located. The southern section of the city, however, remained very poor and was dominated by slums and industrial districts. Reza Shah Pahlavi, who ruled 1925–41, modernized the city by constructing broad thoroughfares connecting the city and beautiful fountains and monuments. The city also became a center of learning with the opening of Tehran University in 1934 and subsequently in 1960 the National University. Tehran also hosted the famous meeting of the Big Three (Josef Stalin, Winston Churchill, and Franklin Roosevelt) during the Tehran Conference of 1943. Since that time, Tehran continued to expand with its own suburbs. Under Muhammad Reza, the last shah, the city was part of the Great Civilization modernization effort that saw the building of nationwide highways, dams, and even model cities. The Islamic Revolution and the subsequent Iran-Iraq War interrupted further city development, namely the implementation of a planned metro subway system. In 2004, the city remained overly congested with buses and taxies, leading to instances of high air pollution and traffic accidents.